No singing and dancing chorus. No splashy musical numbers with taps ringing through the theatre. Not the usual Stages approach to musicals. 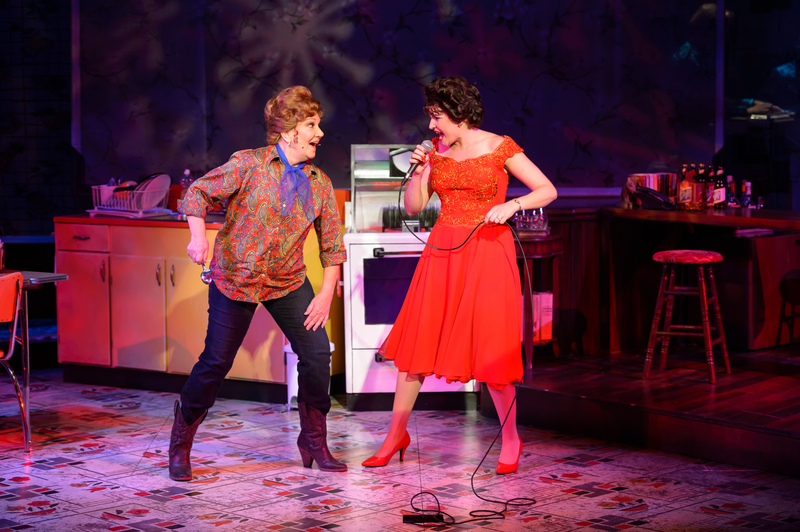 Just two great actress/singers pouring out the story of Patsy Cline and her biggest fan, Louise Seger. My reviewer friends and most of the theatre community know I’m not a big fan of country music. But you’ve got to give credit where it’s due and these two actresses play the heck out of this love letter to a career cut way too short by a plane crash. While this is Ms. Petroccia’s first work with Stages, we all know and love the local gal filling the boots of Louise Seger, Zoe Vonder Haar. Whether it’s the persistent scheming of Dolly Levi or the bawdiness of Meg in “Brigadoon,” Zoe Vonder Haar has been thrilling St. Louis audiences- particularly at Stages- for several years. 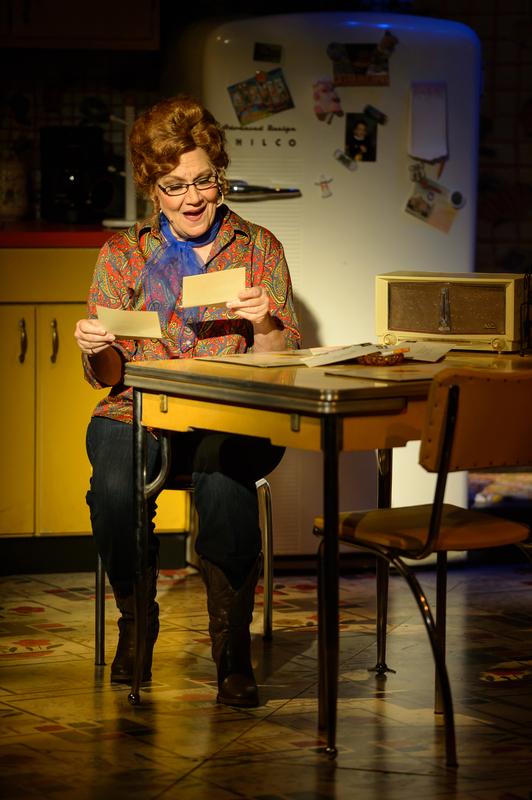 This is one of her most exuberant and genuine moments on stage, playing the role of a real person. After “discovering” Patsy Cline on the old Arthur Godfrey show and then bugging the local radio station to play her songs over and over again, she finally gets to meet her and the rest is history. Her wide-eyed innocence and tender feelings for her “idol” come through loud and clear with Vonder Haar’s wonderful performance. Both ladies- especially Zoe Vonder Haar- talk directly to the audience throughout the evening and, in the guise of Louise, she even makes several trips into the audience. At one point she even crawls through one of the long, long aisles at the Kirkwood theatre to retrieve a willing man to bring on stage and dance with her. It all adds to the “down home” feeling this show engenders and it works well. Michael Hamilton shows he can bring out the best in a small cast as well as those extravaganzas we’re used to from Stages. His direction and musical staging are top notch. 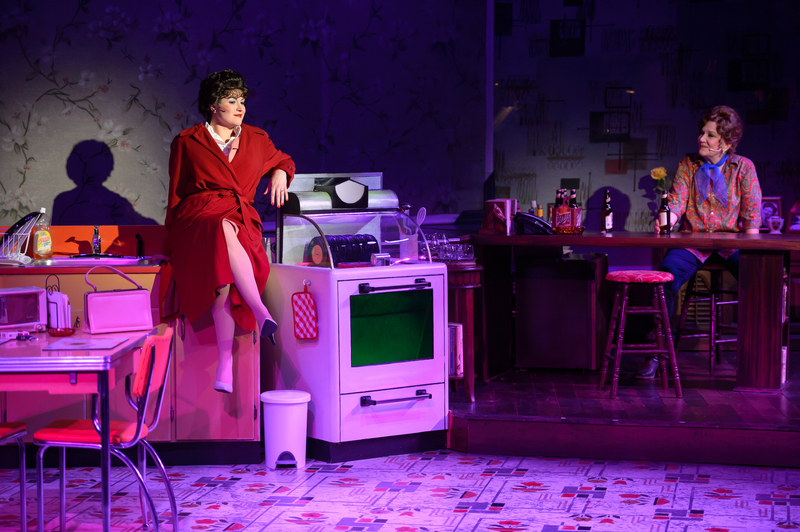 James Wolk’s effective set design features the kitchen and living room of Louise and, behind the scrim at the back, it either lifts to feature Patsy at the Grand Ole Opry and other venues with her music, or is simply back-lit to feature more intimate moments in her performances. Matthew McCarthy provides those great lighting sequences while Lou Bird’s costumes are simply magnificent- particularly the various gowns and country duds for Patsy. It all comes together with the marvelous on stage (behind another scrim that is occasionally lit) band led by Lisa Campbell Albert. It’s a vast departure for Stages but one that works beautifully. It might encourage them to attempt other smaller cast musicals (such as “The Fantasticks”) in the future. I love the big blockbusters like “Legally Blonde” and “My Fair Lady” that come up later in the summer, but it’s refreshing to see the excellence of Stages’ presentations combined with a more intimate show. 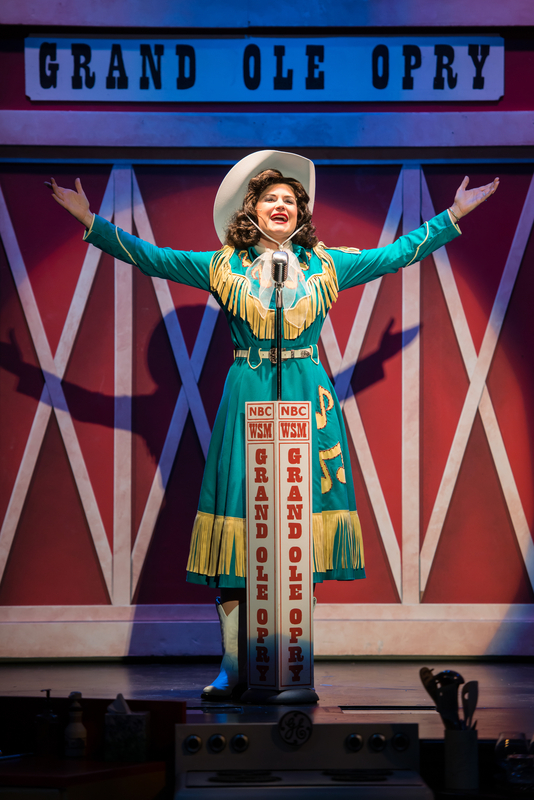 “Always…Patsy Cline” plays at Stages through June 30th. Give them a call at 314-821-2407 to get more information or try to get tickets. They’ve already added an additional performance on Sunday, June 23rd to accommodate the overwhelming popularity of this show. This entry was posted on June 7, 2013 at 9:43 pm06 and is filed under Uncategorized. You can follow any responses to this entry through the RSS 2.0 feed. You can leave a response, or trackback from your own site.